One man’s trash is another man’s treasure. It’s such a simple thought, yet so confounding in its implications. 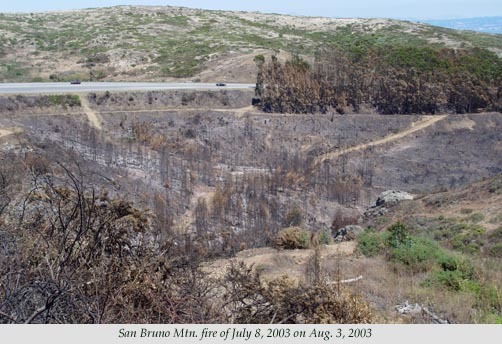 Mother Nature presented a scientific opportunity for biologists and restoration ecologists when she took over an innocuous six-acre planned burn and turned it into a blazing 72-acre extravaganza on July 8, 2003. In a few action-packed hours, over 40 years of mature chaparral was vaporized in Wax Myrtle Ravine on San Bruno Mountain. Some view it as a blackened, barren landscape devoid of life while others anticipate the splendor of verdant activity that lies ahead. The contemporary view of fire, with urban/wildland interfaces, creates a bureaucratic response to the prevention, containment, and cleanup of wild fires. The Wax Myrtle Ravine fire was the largest wild fire on the mountain in many years. The response by the California Department of Forestry (CDF) begins by bulldozing firebreaks along or across ridgelines. Ground crews create smaller scratch lines using hand tools to stop or slow the fire and pump engines supply water to douse flames along the edges. Air tankers drop prodigious amounts of retardant and helicopters dump water (saltwater in this case) on hot spots. Each of these activities stresses the soil and the surviving plant life in its own way. There is a certain beauty in the smell of smoky air, the dust devils, and the feel of the crunchy soil underfoot-soil that has been magically transformed to provide fresh nutrients to grow a new palette of plants from seed banks that may have waited almost half a century to feel sunlight. 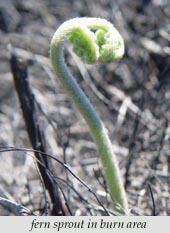 Within two weeks of the fire, coffeeberry and bush monkey flower, which had been cut with chainsaws, began to stump sprout within the scratch lines. Within the burn area, these same species showed no signs of life. Their charred skeletons would at least create moisture from fog dripping to the ground. Right in the middle of the hottest fire area, bog rush and sedges were re-sprouting adjacent to and within a seep. In the creek bed-half way down the ravine-a large patch of tule sedge and arroyo willow were unscathed by the flames, coddled by the abundant water surrounding them. Five weeks after the fire, patches of green appeared. Wild cucumber, poison oak, and morning glory had emerged. It was strange to see the cucumber and morning glory since their siblings elsewhere had long ago gone to seed and were dormant. Spot infestations of poison hemlock, fennel, and nightshade appeared in areas where once-piled eucalyptus slash had burned so hot. The charred poles of eucalyptus began to sprout at their bases. When growth reached 18-24 inches they were treated with herbicide to kill the trees. Along the slopes of the ravine, bracken fern showed rapid growth and bright green flashes of fresh, basal coffeeberry leaves added new color to the landscape, reaffirming the resiliency of nature. Not all was rosy. On the southeastern portion of the ravine, in an unburned area, the toyon and coast sagebrush looked decidedly burnt. Closer inspection confirmed that retardant from the air tankers had chemically burned the foliage. Heavy equipment-like the bulldozer-forms the backbone of CDF’s ground force. The one on hand uprooted hundreds of bulbs of soap plant, which were gathered, potted, and will be returned to the area. Also noticeable were slopes where the ground was more brown than black. These south-facing slopes have soils that are thinner, suggesting the potential for grasslands. By identifying these grassland areas, work can commence to insure successful conversion to butterfly habitat by enhancing native grass species and encouraging butterfly host plants. Cooler north-facing slopes with their deeper soils will revert to scrub communities unless burning occurs on a fairly regular basis. One slope had previously burned on Labor Day weekend in 2001. Studies by Thomas Reid Associates in the spring of 2002 showed good recovery of existing silver lupines – one of the larval host plants of the mission blue butterfly – and germination of new lupines. Stonecrop, the larval host plant of the San Bruno elfin butterfly, survived the fire nicely. A search for golden violets, the larval host plant of the callippe silverspot butterfly, was done in the winter of 2004. A January 2004 field trip led by the author and Jake Sigg revealed mostly natives returning to the landscape. Two small infestations of poison hemlock and sheep sorrel were observed and noted. Scattered patches of maidenhair fern were heartening and flooded the hopes of all the hikers to return at a later date. By this time most of the scrub species within the burn area had stump sprouted. By March it was evident that gorse seedlings were sprouting in humongous numbers, its plutonium-powered seed bank awakened by winter rains. There is much work to be done near the streambeds. Himalayan blackberry is being removed before its primocanes can recover its original territory. Up on the south-facing slopes, life was more hopeful. Golden violets and silver lupines were evident in large numbers. The only discouraging event was the presence of filaree littering the otherwise bare soils. What lies ahead is a great deal of hard work. Most important is controlling invasive weeds. There are thousands of forbs and grasses to plant to control erosion and a creek bed to restore – we hope – to close to its original glory. We are monitoring many sites to chart the rebirth of the ravine. There are plans to involve the local community with restoration projects to promote site stewardship. Perhaps I should emphasize that those are our plans. Eventually Mother Nature tips her hand and reveals her plans. Then it’s back to the drawing board to formulate new strategies as we relearn that our vision always takes second place.